During our latest usability study we used live websites which caused a number of our test subjects to run into technical errors or site maintenance. In 8 out of 9 instances (89%), this led to instant abandonment of the site. Subjects generally showed an extreme level of impatience towards technical glitches, often not even trying to reload the page, but simply leaving it immediately. 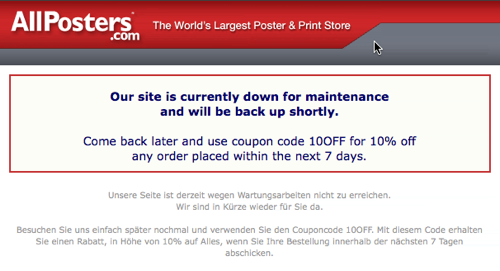 AllPosters give all visitors during maintenance a coupon code so they will come back. This also applied to sites that were taken down for maintenance. Most subjects didn’t really care that the site offered to “be back shortly”. So don’t expect your visitors to come back and make their purchase once your site is up again. The great thing about this approach is that you’re acknowledging the wasted time and frustration of your customer and you’re giving them a reason to wait making their purchase with you instead of just going to another online store, offering the same products or services. Do you have other good ideas on how to handle technical glitches without losing sales? Authored by Christian Holst. Published on April 10, 2010. The only embellishment to that I could think of is something like, “Come back in 1hr – if we still haven’t fixed this we’ll give you a new coupon for 20% off!” Reducing the window of time in which they might anyway shop around and be tempted by the competition.